102 Benefit Street, the Gershom Jones-John Howland House, is built on land that was first developed by Abraham Whipple, a captain in the American Revolutionary Navy. Whipple later became a partner of John and Moses Brown, two of the founders of Brown University and prominent Rhode Island merchants. The Brown brothers were engaged in the trade of enslaved people throughout their careers as merchants, and, upon becoming textile manufacturers, relied on the labor of enslaved people in the American South to produce cotton. Although the historical record is imprecise about the exact role that Whipple played in the Brown brothers’ early trade, his voyages to and from the West Indies make it evident that he was deeply involved in the “Triangle Trade.” The house itself features a plaque from the Providence Preservation Society (PPS), which notes the building’s antiquity, but does not report on this history, or the capital that paid for its construction. Nor is there a historical marker indicating that this land was a gathering point for the Narragansett, Wampanoag, Massachusett, and Nipmuc tribes to trade the fish, eels, lobsters, crabs, clams, quahogs, and oysters that were then abundant in what is now called the Providence River. 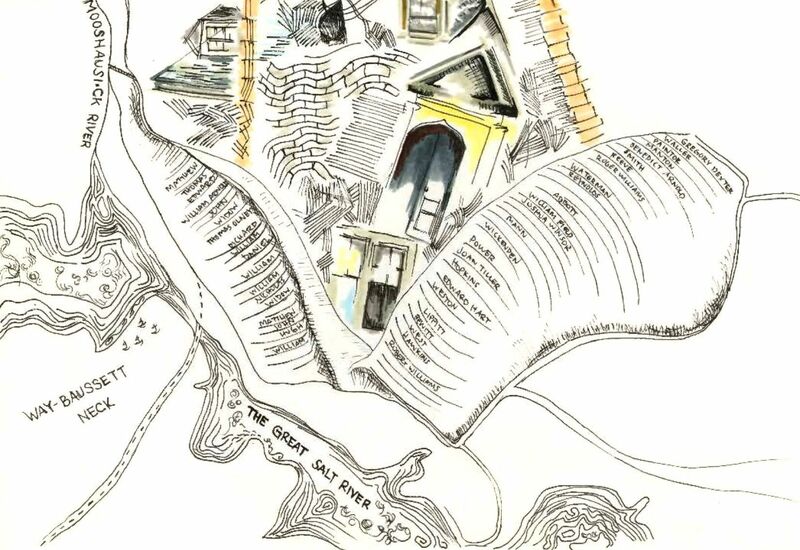 All of these houses were touched by the intersecting histories of slavery and colonialism. According to its website, the PPS’s historical marker program seeks to identify buildings “of historical and architectural significance” to promote greater community awareness of and care for “buildings and neighborhoods.” Although the plaques do invoke historical associations and provide the date of construction and names of original inhabitants, they offer no information on the people or context in which these homes were built. That all the plaques are designed identically suggests a continuity and homogeneity of the houses that is misleading. In fact, these houses were built across three centuries, in many architectural styles and multiple geographic locations—several of the houses currently located on Benefit Street were originally built elsewhere in Providence. The effect of this demarcation on Benefit Street is to privilege the visual and aesthetic markers over the actual history that produced these structures, and which the plaque program is meant to communicate. History is scrubbed in order to create an ambience of past-ness, a past that is entirely white. What exists today on Benefit Street is a highly curated colonial and Victorian landscape that suggests to the casual passerby what the street might have looked like in the years following Providence’s settlement by early American colonists. What emerges is a nostalgia, sometimes inadvertent and other times overt, for a violent history that persists into the present. What happens when this history is aestheticized? What can we do to re-historicize it? Another history of displacement, dispossession, and violence emerges when one digs into the history of the Historic District. 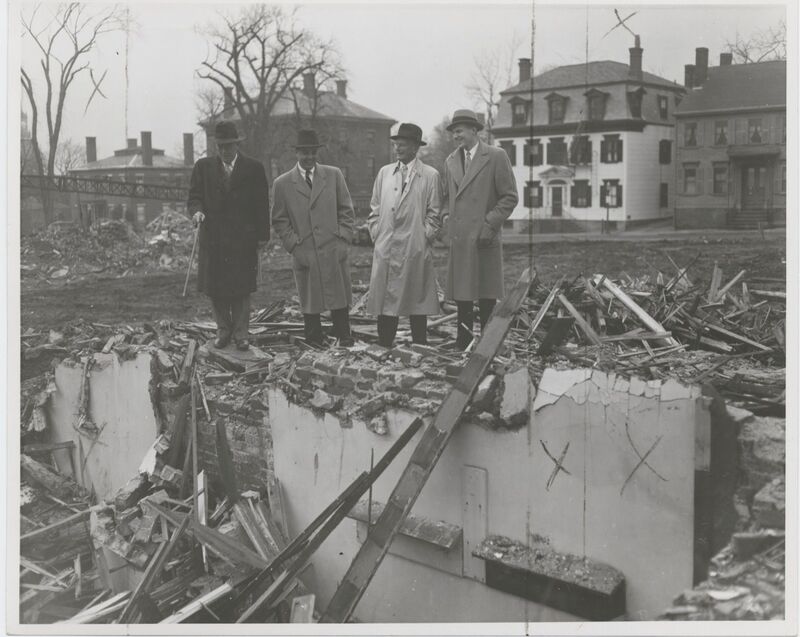 As preservation scholar Brian Greenfield writes, between 1951 and 1955 Brown University razed approximately 66 houses on the East Side of Providence to make room for campus expansions, including the Keeney Quadrangle. In response, a group of white residents of the East Side, spearheaded by Antoinette Downing, took up arms—in defense not of the occupants displaced by the University’s developments, but of the houses themselves. Downing and her supporters were outraged by the destruction, arguing that many of the demolished structures were historic. Downing was similarly worried about nearby Benefit Street, which was dotted with structures that dated as far back as the early 18th century. With the goal of protecting these structures tied to the very first European settlements in Rhode Island, she founded the Providence Preservation Society in 1956. By this point in the 1950s, Benefit Street had become a lower-income, mixed-race community of college students and Eastern European immigrants that did not resemble the wealthy, white merchant class that had built it. In a 1985 New York Times interview, Downing describes with disgust how the homes were almost universally multi-family, and many were tenant houses, with as many as five or six people living in one room: “[Benefit Street] was such a slum then. It was a dangerous area and people were afraid to walk down it. The houses were all covered with siding and it looked perfectly dreadful.” The concern was not with the people who could not afford better housing—and who would be displaced if Brown were to continue to expand in that direction—but with other people who felt it was dangerous, and with the houses themselves, that were sadly covered with ugly siding. Providence, like most other Northern cities in the post-war period, was experiencing an influx of European immigrants and Black migrants from the South; meanwhile, white people were steadily leaving the city for nearby suburbs. In the eyes of Downing and her supporters, Benefit Street, the original site of colonial settlement in Rhode Island, had become become a “slum.” The protection of the historic houses became a way for Downing and her compatriots to hold fast to a colonial heritage against the tide of changing demographics. White elites across the US, in response to these immigration trends, moved to solidify their cultural hegemony by forming preservation and historical societies. Historian Barbara Howe writes that “late-19th-century, middle-class, white Americans searched for their roots by establishing historic sites that legitimized the nation's relatively short history. As individuals, many sought Mayflower immigrants or Revolutionary War soldiers as ancestors, hoping to distinguish themselves from the new Eastern European immigrant.” This preservation movement that rose in the wake of this early wave continued through the ensuing decades with the same preoccupation of protecting the white settler-colonial heritage of the nation. The first project of the PPS, an organization situated squarely in this tradition of preservation, was to reclaim Providence’s white heritage. Its first initiative, funded by a federal grant in 1959, was to write a comprehensive proposal for the preservation of Benefit Street’s historic homes. This effort culminated in “College Hill: A Demonstration Study for Urban Area Renewal,” which became an influential document in the national historic preservation and urban renewal movements. After renovation, Burnside Company sold these properties at the original cost plus renovation charges, often tripling the price of the home. Greenfield notes that a house purchased by the company for $5,000 to $10,000 in the 1950s might sell for $45,000 in 1960s, after restoration. These companies also profited from a 20 percent federal income tax credit, born out of the Tax Reform Act of 1976, which incentivized preservation as a method of urban renewal. The families that purchased these homes from Burnside after their renovation also profited as the values of their new homes continued to appreciate throughout the decades that followed. Moreover, the city government profited from tax base increases and a new site for tourism. This accumulation of capital by the city, for-profit preservation groups, and largely white homeowners was predicated on the displacement of the Benefit Street community. Similar mechanisms for inequality were at work in the contemporaneous redevelopment of the nearby Lippitt Hill neighborhood. The land, directly north of Brown’s campus, between North Main, Olney, and Camp streets was a part of the original Brown estate, but was sold by Moses to a former slave, Noah Brown, who became the area’s first occupant. By the 1950s, Lippitt Hill had become a thriving, mixed-race, mixed-income neighborhood, at some points Providence’s largest Black neighborhood. Despite this history, and the ties Lippitt Hill had to the Brown family—whose other houses were preserved where they stood across College Hill—the neighborhood was condemned by the Providence City council in 1959 and demolished to make way for the University Heights development. Antoinette Downing was a member of the board of University Heights, Inc.
Urban renewal and neighborhood community projects have received much critical attention in scholarship of recent decades for exactly these reasons. Scholar of African American history Kwame Holmes, for example, details the way that projects of neighborhood improvement create housing insecurity and expose displaced Black families to attack “from white supremacists, ill-health, street crime, and police harassment.” The preservation of homes on Benefit Street follows the same pattern: after being displaced, Black renters and homeowners alike faced legalized discrimination in the housing market and were excluded from most neighborhoods on the East Side. The historic restoration of Benefit Street, then, was premised on the differential valuation of Black and white communities; the creation of this white imagined past, and the subsequent gentrification, was predicated on the removal of its Black residents. These are parts of the story that are not apparent in a walk down Benefit Street. These are the histories certain understandings of historic preservation seek to occlude. But how can we move beyond a critique of historic preservation into a more generative conversation? How can preservation function beyond the romanticization of the white past? One of the PPS’s current advocacy priorities is the opposition to the reconstruction of the controversial and badly decayed 6-10 connector—an elevated, limited-access highway that cuts across the Olneyville, West End, Federal Hill, Silver Lake, Hartford, and Valley neighborhoods of Providence in order to to connect areas west of the city to I-95 downtown. As is often the case with the construction of limited access highways, the 6-10 connector cuts through poor neighborhoods of color, severing them from the other side of the highway and exposing the residents to harmful noise and atmospheric pollution. The PPS joined neighborhood associations in calling for the complete rebuilding of this highway in order to restore connectivity between these neighborhoods and create more community space. This suggests a model of preservation that is restorative rather than merely preservational, and, incidentally, one which seeks to ameliorate some of the harms caused by the same white flight that initially emptied Benefit Street. Unfortunately, however, advocacy by the PPS, the city of Providence, and neighborhood coalitions was only partially heeded by the State, and on January 8 of this year, construction began on a plan that leaves the highway intact and mostly above ground. In taking a public stance on such issues, perhaps the preservation movement is moving beyond the narrow valuation of white-built heritage to a broader and more inclusive project, as Robinson suggests. One that seeks to preserve not just beautiful houses decontextualized from the violence that underwrote their construction, but rather toward a notion of preservation with and not against history. Toward preservation that is not predicated on the displacement of residents, but instead one that advances a deeper understanding of the ways history continues to reverberate today. Ilan Desai-Geller and Kerrick Edwards B’18 admit to seeing beauty in Benefit Street's houses.